Story Blurb: Farming in the Canadian backwoods in the late 1800s was a prospect that enticed many young Englishmen to cross the Atlantic. 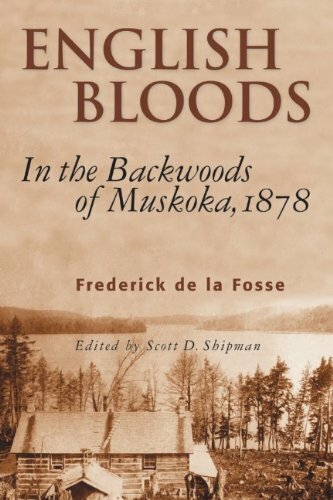 One such fellow was Frederick de la Fosse, whose well-meaning uncle paid £100 per annum for his young nephew to serve as a farm pupil in the northern reaches of Muskoka. Some years later, de la Fosse wrote an illuminating and humorous biographical account of the trials and tribulations of the “English Bloods,” the local epithet attached to these young lads attempting to hone farming skills in a land never intended to be agricultural. And, in so doing, de la Fosse chronicles the realities of pioneer life in the area. De la Fosse is also quite candid in enunciating his own level of naiveté, and if there ever was a ‘pigeon’ ready for a plucking it was young Frederick. Indeed, within hours of his arrival he had been conned out of $10—quite a hefty amount in 1878—by some wily Canadian con artists. He was also quite a source of amusement to some seasoned Canadians when he mentioned that he had actually paid money to learn how to “farm”, i.e. chop trees and clear land. It didn’t help his image, either, that he was attired in a shirt a tie for the tasks. Some of the characters de la Fosse encounters along the way are also quite colourful. One such was a Mr. Yearley, whom de la Fosse describes as weighing nearly three hundred pounds. He therefore describes the experience of having to share a bed with him and his son, John Yearley. As it transpired, his mentor in the art of farming, a Captain Harston, knew very little more about husbandry than young Frederick and the three other, similar apprenticed lads, but he was very good at expounding on the topic while the boys did the actual work. Nevertheless they kept a ‘stiff upper lip’ and muddled on regardless; becoming hardened to the rigours of the job in a relatively short time. It is remarkable, therefore, how the human spirit can adjust to even the most challenging set of circumstances. As one might imagine the experiences encountered by such an uninitiated novice were many and varied; some harrowing and some hilarious. One of these might have fit into both categories. “The Hayes family consisted of himself and four or five children. The eldest of them, a girl, was perhaps seventeen years of age. I had paid several visits to the cottage and got to know the family well. It was rather a surprise to me, however, to see Sandy enter our room one Sunday morning for the purpose of paying a visit for we were not intimate friends. The others had taken advantage of the beautiful morning and had gone to the lake for a bath, but I had preferred to remain in bed, so Hayes and I had the whole place to ourselves. The first I knew of his appearance was when the door slowly opened and I caught a glimpse of his frowsy, unkempt head as he leaned forward to see if anyone was in. “Come in, Sandy,” I said, “what’s brought you here this morning so early?” But Sandy was a taciturn individual and vouchsafed never a word in reply. He slouched into the room and without more ado sat down on the edge of the bed and began to chew viciously at a straw. He was quite a picturesque specimen of humanity, owing to his general getup and commanding figure. He stood fully six feet high and with his red shirt, his trousers tucked into his boots, and a flaming tuft of carroty hair sticking upright through a hole in his greasy straw hat, he might have posed as a model for one of Garibaldi’s warriors. He was evidently in a very serious mood; so I concluded to let him take his time. The minutes flew by, and still Sandy chewed and said nothing. I was just about on the point of again asking what had brought him to our abode at that unconscionable hour when he brought his heavy first down on my leg with a resounding smack and broke the silence by ejaculating “Say!” “Yes,” I gasped out; but the poor man was again floored and could get no further. Then he began to whistle and after he had got through two or three bars of “Protestant Boys” started to perambulate round the room. This behaviour was beginning to get on my nerves and I jumped out of bed and started to put on a few things. “You’ll excuse me,” I said, “but if you will have what you want to say figured out by the time I come back from my bath, I’ll see what I can do to help you.” This showed him that time was precious and that he had better unbosom himself. He stopped in his stride and burst out with another “Say!” “Yes,” I again answered. This is a charming and heart-warming tribute to the unsung pioneer, written in a dry-martini-like-humour that is sure to please regardless of where in the world the reader might live. Special mention should be made of Scott D Shipman who not only did an excellent job of editing the writing, but who also spent eight years researching other, related parties mentioned in the story. Highly recommended for everyone in the family! See a preview of Coming of Age on the Trail.